Perfectly thick and chewy cookies with NO chilling time – these Coconut Oil Cream Cheese Chocolate Chip Cookies are full of delicious coconutty-cream cheese flavor! I wanted, reallllllly wanted, to call these “perfect chocolate chip cookies” and I almost did. But in the end I ditched that name and went with something a little more practical. Why did I do that? Because everybody and their dog has a different idea of what a perfect chocolate chip cookie should be. He thinks it should be crispy, she thinks it should be bite-sized, his mother only likes them if they are warm from the oven with at least seven chocolate chips in each bite. We can’t all agree on the “perfect” chocolate chip cookie. Heck, right here in my own house we have a major disagreement about perfect chocolate chip cookies going on. These cookies? Case in point. These are MY very absolute favorite, totally perfect chocolate chip cookies. My husband doesn’t like them. I love them so much that it actually offends me a little bit that he doesn’t care for them. But we’ve agreed to disagree. For the sake of our marriage you know? These cookies fit all of my requirements in texture, color, size, and the work entailed. These cookies are crispy on the outside, but soft and dense and super chewy on the inside. Thick too. I like my chocolate chip cookies a mile tall. They’re extra rich but have just the perfect amount of sweetness and the best part its that they require ZERO CHILLING TIME. I hate hate hate chilling time. I really do. Sometimes I do it. Because it’s necessary to achieve a certain texture etc etc etc. But for chocolate chip cookies I really hate it. Because when I want chocolate chip cookies I want them yesterday. I do not want to wait for that dough to chill. This recipe is my favorite because it whips up so quickly and you can pop them straight in the oven and still get that texture that you are hoping for when you normally would chill your cookie dough. It’s something about that coconut oil and cream cheese together that is just magical and makes these babies puff up beautifully. 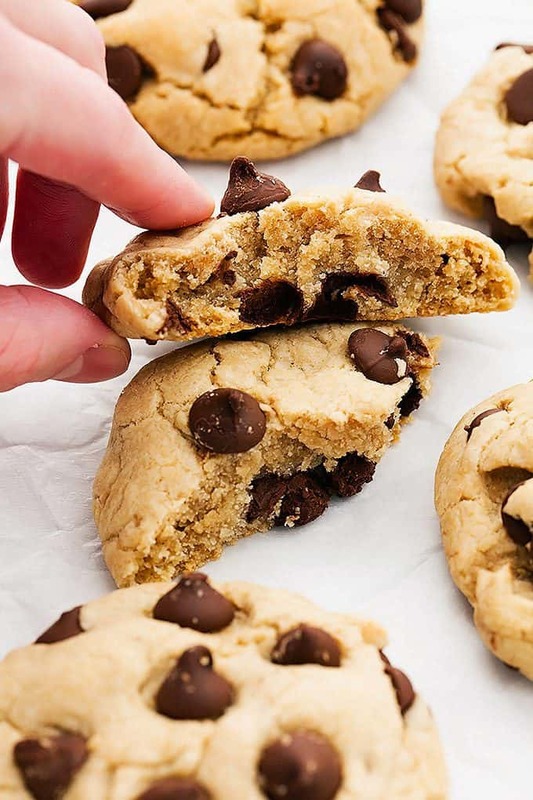 If you like big, thick, chewy, tall chocolate chip cookies with extra richness then these gorgeous babies are exactly what you are missing in your life. Make them! And bring me a plate when you’re finished, I’ll gladly help you devour them. “Wow! These are great. The dough was awesome, the cookies are even better. They are different somehow, almost a crispiness to them but soft too. Oh, how to describe? Just try them! Super thick, chewy, extra rich chocolate chip cookies that require NO CHILLING TIME! Preheat oven to 350 degrees and lightly grease a baking sheet. In a large bowl mix together coconut oil, cream cheese, and sugars until well blended. Add vanilla and egg and mix well. In another bowl whisk together flour, corn starch, salt, and baking soda. Add dry ingredients to wet ingredients and mix until incorporated. The dough will be crumbly but keep mixing until it comes together. Mix in milk 1 teaspoon at a time until dough will stick together. Stir in chocolate chips. Roll dough into 1 1/2 inch balls. Place on baking sheet 2 inches apart (they won't spread very much). Bake for 10-11 minutes until just barely starting to brown on top. Allow to cool 5-10 minutes on the baking pan, then transfer to a cooling rack to cool completely. Serve at room temperature and store in airtight container up to 5 days. 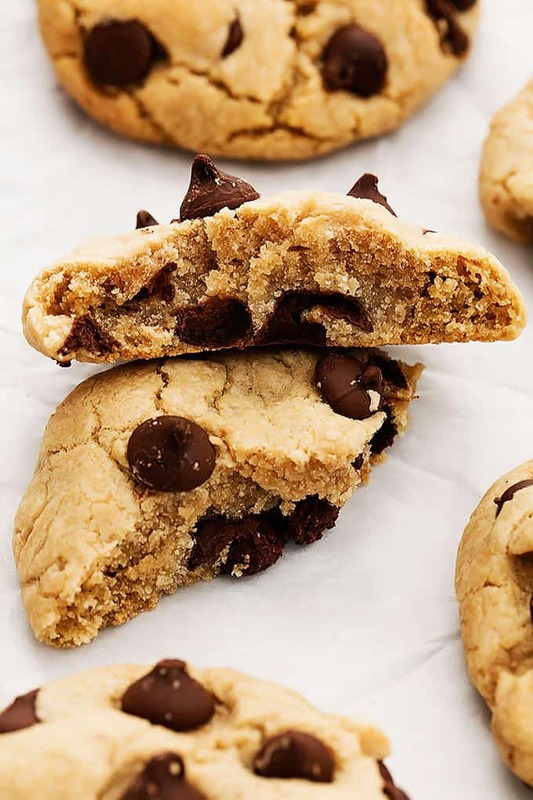 Try these other Cookie Recipes you'll love! I am going to make these today. 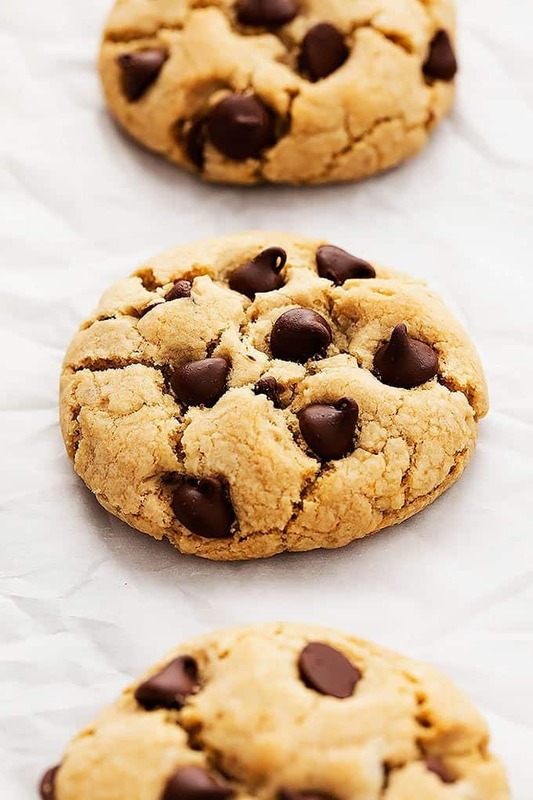 I have been craving chocolate chip cookies and I think I just found a new recipe to do so! I made these this afternoon. My husband said “most excellent”. I think I’m going to try these today. They look awesome. I made these this afternoon and they were awesome. Super simple and super good. Thanks for the great recipe! So glad you like them Ashley!! I read food blogs all the time, but I’ve never commented on one…until now. 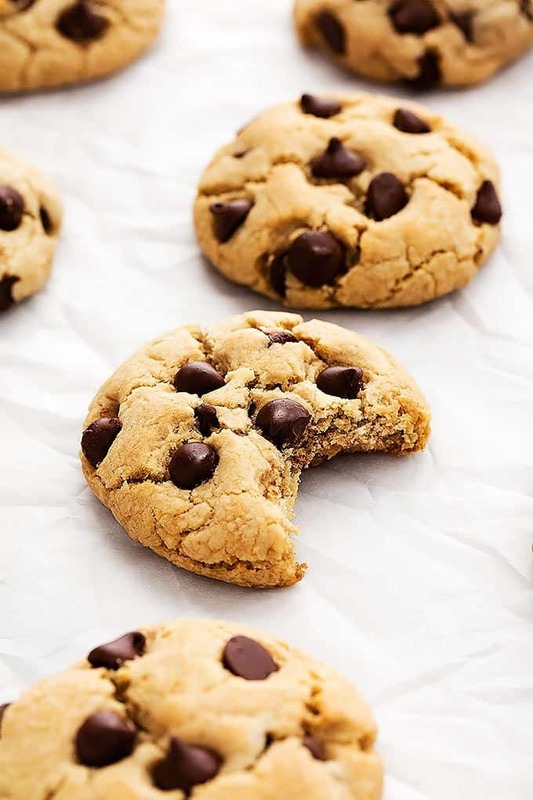 I’ve tried SO many chocolate chip cookie recipes, and these are by FAR the best (and easiest) I’ve ever made. I took them to a party, and got compliments from at least five or six people who I didn’t even know! Thank you so much for sharing this recipe! Wow! These are great. The dough was awesome, the cookies are even better. They are different somehow, almost a crispiness to them but soft too. Oh, how to describe? Just try them! The ingredients say baking powder, the recipe says baking soda. Which one? Hi Kelly- my mistake! It’s fixed now. It should all read baking soda. Thanks for pointing that out! Our family always adds dissolved coffee to the dough – try it! wow- that’s an awesome idea! Thanks for sharing, Emma!